[시사뷰타임즈] 땅바닥에 절단된 손이 있다는 신고를 받은 경찰이 화요일 미들스브로 인근의 분주한 주요 도로 일부를 봉쇄했다. 경찰관들이 A19로를 봉쇄하면서 현장으로 달려가서 발견한 것은 고작 가짜손이었다. 폴트랙과 노튼 사이에 있는 북쪽방향 도로 나들목에서 겉으로 볼 때 소름끼치는 것을 발견한 건 한 시민이었고 그는 즉시 경찰에 알렸다. 클리블랜드와 더햄로 치안 경찰대는 그 잘라진 손은 연극이나 영화에서 쓰이는 소품이었다고 말했다. 경찰대는 훼이스북에 올린 글에서 “눈이 날카롭고 자동차를 모든 시민 한 명이 중앙분리대 좁은 곳에 있는 수상쩍은 물건을 목격했던 것”이었다고 적었다. 한 훼이스북 이용자는 “테러 리스트구만(terror wrist: 테러 손목; 테러분자는 terrorist(테러리스트)”라고 재담을 던졌다. 또다른 사용자는 “손 하나가 A19로를 폐쇄시킨거야?”라고 했다. 변장용 소품 때문에 영국 경찰이 놀림을 당한 건 이번이 처음이 아니다. 지난해, 심각한 공격 사태가 있다는 신고를 받고 맨체스터와 리버풀 사이에 있는 M62로를 따라 푸른등이 번쩍대가면서 달려갔다. 경찰이 발견한 것은 잡역배우 한 쌍이었는데, 그들은 좀비차림을 하고 연기를 하고 있는 중이었다. Police shut part of a busy main road near Middlesbrough on Thursday following reports of a severed hand found on the ground. Officers rushed to the scene, sealing off the A19, only to discover the hand was a fake. The seemingly gruesome discovery on the northbound carriageway between Portrack and Norton slip roads was made by a member of the public, who alerted police immediately. 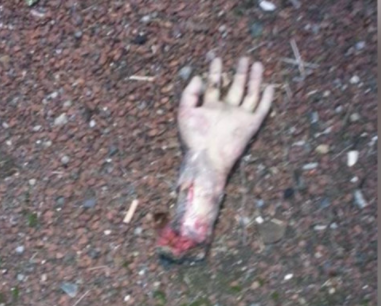 Cleveland and Durham Road Policing Unit said the ‘hand’ was in fact a prop. "In a nutshell, an eagle-eyed diligent member of the motoring public spotted a suspicious looking item in the central reservation," they said in a Facebook post. Then, the jokes rolled in. “It is a terror wrist,” quipped one commenter. “Single handedly closed the A19?” another said. This isn’t the first time British police have been fooled by fancy dress. Last year flashing blue lights rushed along the M62 between Manchester and Liverpool over reports of a serious assault. What they discovered was a pair of extras, dressed as zombies, on their way to an acting job.